Tonight Alive are celebrating their worldwide Billboard charting positions for Underworld. Including the #1 Australian Artists Chart and #11 ARIA Albums Chart in Australia, #4 Current Alternative Albums, #5 Record Label Independent Current Albums and #11 Top Current Rock Albums in the United States, #3 Rock Albums, #6 Independent Albums and a Top 100 Albums spot in the UK while rounding out the Top 50 on Canada’s Alternative Charts, it was an incredibly successful week for the band’s first release on Hopeless Records (UNFD in Australia and New Zealand.) Already heralded by press as some of the band’s best work to date, Underworld is available today on Spotify, Apple Music and iTunes. Physical albums and merch bundles are available at http://smarturl.it/TAUWmerch. This success has been echoed across radio with Underworld being chosen as Triple J Radio’s feature “album of the week” and the band’s latest single, “Disappear” premiering as Annie Mac’s Hottest Record on BBC Radio 1. Streaming services have been showing their love to the single along with “Crack My Heart” and “Temple.” Songs from Underworld have been featured in over 15 Spotify-owned playlists across the platform including New Music Friday, The Scene, Rock This and Crash Course and the band’s monthly listeners have reached nearly 900,000. Last week, Tonight Alive returned to the United States for an intimate run of acoustic in-stores and kicked off their Co-Headlining Tour with Silverstein. 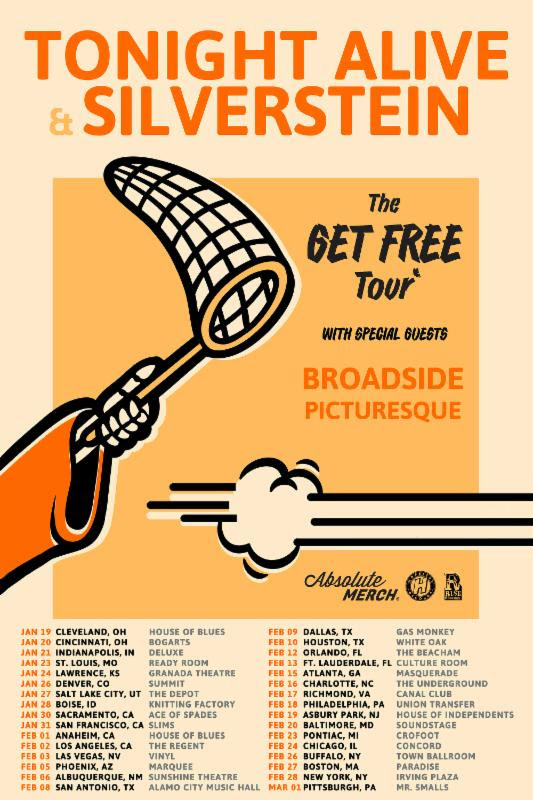 With support from Broadside and Picturesque, The Get Free Tour is hitting cities all around the United States over the next month. Tickets are on sale now at http://tonightalive.com/.